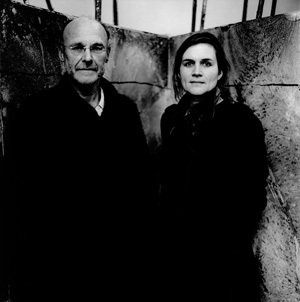 H2N: Talk to me about the first time you saw Anselm Kiefer’s work. As an artist yourself, what drew you to him? SF: Well, I actually don’t like to think of myself as an artist because I think of myself as a filmmaker and I feel like that is a very particular practice. It’s full of technique, of film language; there’s so much in filmmaking that I don’t need to throw that to the side and claim to be an artist. I just think that to claim to be an artist is to claim a special type of perception, superior to the cognition of everybody, and something about that doesn’t interest me to claim for myself or for my work. As a documentary filmmaker, I’m documenting the subject, and in that sense I’m serving the ideas that are coming through from the subject, responding to them; you embark from a very different place to a very different destination in a way. But what drew me to Kiefer’s work; I did go to art school briefly and I did paint. So, I’m coming from a fine arts background. 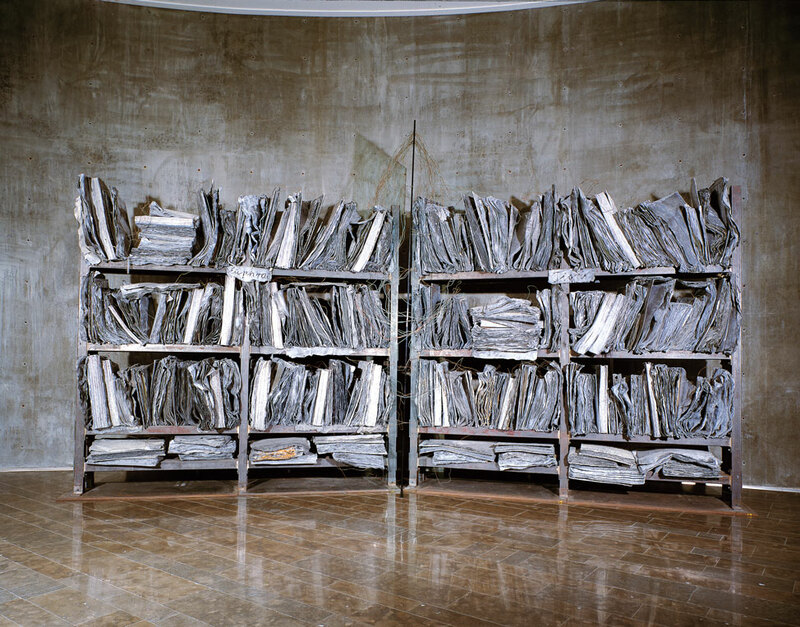 When I was about 20, I saw this Anselm Kiefer installation called High Priestess, which is one of his huge book cases with the lead books, and I was astonished and thrilled. When you see his work, physically, that piece, it really seared its presence into my psyche. It’s no less than that. There were so many ideas in what the image suggested, so much could come out of that image to do with the knowledge inside books that is somehow inaccessible or even dangerous, the weight and the size of the books, the reference to a lost library and the direct physicality of the books; the lead and his insistence on the use of that material. All of those things really had an impact on me. The film came about because I had met him on a few occasions through shows; his gallery knew that I liked his work. The gallery and he called me, somewhat spontaneously, saying “Come down to Barjac.” The gallery then called me back and said “He’s leaving Barjac… it’s an amazing moment and it is an extraordinary place. Why don’t you just come and see it?” So, it was a very loose invitation and when I got there I saw this extraordinary place. The filmmaker in me was completely challenged and there were so many possibilities somehow. I had to make a film there. H2N: You felt even more galvanized by his work being in that giant ruin that he had created? Did it pull you closer to him? SF: Absolutely. I mean, it is a whole world, a hermetic world and when I was filming there I didn’t leave at all. I was filming for three and a half weeks and never left the location. It was a shock to come out into the world after being in such an insistent visual aesthetic place. It’s his own universe. Funnily enough, he had a big car, like a Mercedes or BMW and he actually had covered it with ash because he didn’t like the car in the landscape. He had to get all of the ash sandblasted off the car because he kept getting stuck at customs; he’d cross the border and they’d be like “What the hell is this vehicle?” (laughs) When I left, I even noticed the airplane I flew on was bright orange and it felt like a huge contrast. I loved being locked in that world, there’s a very bucolic splendor as well, that outdoor rural environment. Now that he’s left and is in Paris, I think he actually misses Barjac. H2N: Well, he built something that feels permanent, something like a ruin. Do you feel that what he built in Barjac will last? SF: I don’t know and I don’t think he knows. I know he wants to develop the Kiefer Foundation and he wants to get that financed by the French and German governments. The conversation is going on about that. But there is something about the place that lends itself to falling apart, to total decay. For example, he built that concrete amphitheater with no foundation so, in fact, he’s waiting to see and is quite disappointed that it hasn’t started to fall down. Part of it is made to fall and for nature to take over. The maintenance of it, even when they were living there, was difficult because nature is so insistent and has such force; it would just grow and grow into the white spaces that he created and undermine everything. He sees nature as a co-worker, as an element that he’s working with. So, I think he would like it to be preserved but he loves the fact that it will change. H2N: As a filmmaker, you seem to adapt your visual style to the subjects you’re working with. But working with a visual artist who creates such strong images himself, is there an intimidation factor, that somehow you’ve got to represent the work in a certain way? SF: Yeah, definitely. You feel very anxious because it’s fifteen years of his work and more people are going to see the film than visit Barjac. I spent a lot of time reading and having lots of conversations with him and all of that processing and percolating… and then also listening to your intuition. We know that intuition isn’t coming from nowhere, it’s a very, very fast, sophisticated cognitive process, so I always listen to those ideas very carefully. I was definitely aware of his canonical stature as a fine artist and that anxiety doesn’t really ever go away, even when the film’s finished. H2N: How did that anxiety influence the visual structure of the film? SF: I think Anselm is interested in making films. I think he would like to be a filmmaker if he could, so I collaborated with him very closely and I showed him material and I was very open with what I was shooting, thinking “If he doesn’t like it, at least I’ll know it before I finish the film.” So, I sat him down and said “Anselm, will you look at what I’ve shot and see what you think” and I would watch him, to see when he would lean forward to the monitor and get excited or when he would literally say “This is a nonsense frame.” I realized that he sees very frontally, his compositional sense is very frontal and symmetrical, like the way his paintings are, often a big expansive space with an object that you’re traveling toward on the horizon, the sense of creating space. That gave me a signal for the camera, for how to approach the point of view from which he paints. I actually love frontal framing anyway, so I brought all of those things into how I framed the film. It was actually a great opportunity for me to explore this type of cinematography. He created an extraordinary landscape which suggested itself to film and it was a great opportunity and a challenge to take that up, even though it was fraught with the sense of his work. But I also know that he doesn’t make time based work, so watching the film on the monitor, he would always freeze the images and say “That’s a nice frame!”; he saw it in terms of static images and not as images moving in time, so I realized that that was an area where I would be working on my own. H2N: In flip-flops, which is terrifying to watch. SF: What’s so funny about that is when I was filming that, I was so aware of the sound of the smashing glass that it was only in the safety of the editing room that I suddenly realized how crazy it was that he was wearing flip-flops. But at the time, it wasn’t something you’d have gone into the room and seen. But that’s why filming is so powerful, it transforms things. The image suggests its own ideas, its own tensions. So, then of course, I cut it with those flip-flops in mind. SF: Yes, I had to react really fast and it was exhausting because he works so fast. He would say “Sophie, are you ready? !” and I would be struggling to keep up because he wanted to work at the speed at which he’s used to working and I didn’t want to stop that, but it was really hard work to be “catching” those things. It was also wonderful, the drama and excitement of that. H2N: I’m getting the sense that he orchestrated the filming as much as he orchestrates his assistants, as if he pulled you into the process and made you a part of his work. SF: Yeah, he is a kind of Prospero in that sense and I played along with that. And I was interested to learn. One of the things you face when you make a documentary is a struggle for resources; do I have enough money, can I do this, can I afford that and he said to me “Sophie, don’t limit yourself”. His way of working is “If I want it, I make it happen.” He has an incredible drive and it was exciting to play with that sense of possibility. When he wanted to smash the glass in the vault, stupidly I said to him “Anselm, why would you do that?” I lamely asked this banal question of “why?” and he immediately came up with this invented reason “Oh, it’s Walter Benjamin’s angel of history!” But about a year later when he looked at the film it was suddenly about Greek plate smashing. [laughs] He’s completely re-positioning meaning in his work anyway, it’s one of the things that drives people crazy trying to find a way to read his work, in that it is ambiguous because of how he plays with words. I kept a notebook when I was filming and kept writing down things he would say and one quote that made an deep impression on me was “I push words and words push me.” And I really relate to that. If there’s anything personal about the film as it relates to my interests, it’s the relationship of words, because they’re generally absent, but when they come, they come with such determination. I really like that. H2N: People who are not as familiar with Kiefer’s work may be frustrated by this. I think a lot of people have a very emotional response and they’re not sure what to make of the relationship between the work, the film and their feelings. You’ve worked with Žižek, who is sort of a master interpreter and now Kiefer, who seems to defy interpretation. SF: I think that’s real with Anselm, there’s the sort of cat and mouse thing where he draws you in, but there’s almost a fear of the creation of feeling that the work provokes. It’s frightening in that way because one doesn’t understand it. And his relationship to beauty is really ambiguous. 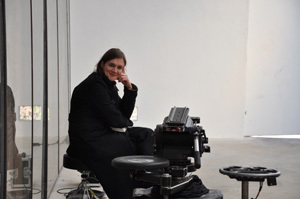 I felt that actively when I was I was filming and there is something uncanny about that in his work. It’s very beautiful, but why is that? Does beauty even mean anything? No, I don’t think it has meaning. Beauty doesn’t have meaning, we just have this intense response to it. That is why I ended up shooting on film; I was working in HD but the work was more beautiful on film, the sensual surface of the work. And then people distrust beauty, that’s the other thing. They distrust it and so they distrust him because they feel “Why is it so beautiful but it’s about the Holocaust?” You’re driven into a response. You can see it how he can arrange the materials, he has this amazing ability to pull objects together. The towers at Barjac, for example, were built by eye and balance. It’s also about destruction; there’s a violence in it, there’s this will to destroy. H2N: Yes, the work feels like the end of a story but you don’t know what the story was. You’re just left in the aftermath. SF: I’m just having an idea now that this urge to understand what things mean is the space of childhood. It’s where you are in the first ten years of your life. You have to deal with a lot of unknowns and a lack of comprehension. One of the things that I was very aware of with him is this privileging of the experience of childhood. He talks about it in the film, about the empty space and the nothingness, this abyss of meaning and time. All of that time ahead of you as a child, it’s unknown what it’s going to deliver. When you start to become aware of time—as a twelve or thirteen year old, I became aware of the life I had ahead of me and what I would be subjected to—it’s very frightening. H2N: Do you see the relationship of the film to his work in that way? Did you have your own intent about what you wanted the film to mean? He has his work, but your capturing of it is a completely different project. SF: That’s always going to be the case when a film is made of a subject. You only don’t see it when the film is using pre-existing tropes and methodologies and obvious strategies of talking heads, voice overs– typical documentary. Because we’re so used to that, because we know how to read that, we don’t feel the gap between the filmmaker and the work. But that kind of approach doesn’t interest me as a filmmaker because it hasn’t got enough tension. I think if I look at my films, they all have this desire to kick you in the gut. Even with Žižek, even though he’s making these hilarious asides, there’s something really frightening in what he’s presenting. I do like that shuddering response. I like to create those feelings, playing with these responses. Film has an amazing capacity to work with our responses. It’s a frightening medium, really. It’s has been used and still is used to make amazing propaganda. You ask yourself a lot of questions when you’re making a film. I like to try something where I don’t know what the impact will be, then you release the film and you start to get the responses and it’s fascinating. When I’m filming, I know how I’m feeling, but when I’m watching them or cutting them, I’m feeling different about them every day. A film is concrete, it doesn’t change like a theater performance, but when you watch a film again and again, you see it a different way every time. You’re always coming at it from a different place. H2N: This reminds me of Tarkovsky, who saw film as “sculpting in time,” that the film is image, sound, performance etc., all of it fixed in time and preserved on film, but who also grappled with Nietzsche’s concept of the Eternal Return, of time playing itself over and over again. SF: It’s funny you say that because I saw Stalker when I was about 18 or 19, and then I saw the film ten years later when I was working on The Pervert’s Guide To Cinema, and I found I could objectively re-visit myself as the 18 or 19 year old I was when I saw the film the first time. I find that amazing about films, that they can be storehouses of your emotions, and when you re-visit them they re-evoke these feelings. They’re amazing like that, in their ability to provoke an intense emotional reaction. That is what I like. I choose my subjects because of their ability to make these intense feelings possible. H2N: What you describe brings up the music in this film, the György Ligeti music, which was used by Kubrick in The Shining and 2001: A Space Odyssey and is very evocative of cinematic memory as well. SF: The way I came upon the Ligeti was a conversation with Anselm. He said “Yes, yes, we know what the footage will look like, but what will you do with the audio? We don’t know what it will be.” And I remember thinking “Oh yeah, it’s true.” And when I got into post-production, I tried a lot of music trying to find what music the film would have a dialogue with. Anselm had made an opera at the Opera Bastille with a young composer named Jörg Widmann. I listened to Widmann’s music that Anselm had selected for this collaboration to get a sense of it, because Anselm doesn’t really listen to music aside from occasionally he’ll play Marlene Dietrich and The Velvet Underground. At the time, I was reading Alex Ross’ The Rest Is Noise and I felt that music had to speak to things I was not overtly talking about; things like German history and the Holocaust which are a huge part of the emotional core of Kiefer’s work. I didn’t want to be heavy handed, but at the same time I wanted the music to have a contextual vibration in the film as well as working formally, penetrating the subject and taking it further. You have to be careful because you don’t want to take it in the wrong direction or underline things. So, I was reading Alex Ross’ book and he described Ligeti’s Lontano. I knew I already I wanted music that had long sustains in it and music that also had to have this ambiguity. I liked the Ligeti because he doesn’t use melody or harmony; he doesn’t use the elements in music that create an emotional certainty or an emotional bombast. The Ligeti puts all of this on hold and uses these sound textures and the harmonics that come between them; there is a layering of sound that is like an object and makes time into an object. All of the ideas Ligeti was working with when he composed this music seemed to have a relationship to the monumentality of the Kiefer, that after the bombast and certainty of fascism, music must have this lack of emotional closure. That lack of closure is also present in Kiefer’s work and is why both disturb in many ways. So, I was excited to have come across the music and Anselm ultimately liked the music as well. That was important and a relief to me. He just took it as sound. H2N: Can you tell us about what you’re working on next? H2N: The same strategy as before with The Pervert’s Guide To Cinema? SF: It’s a continuation. It’s fun to do and it’s a great way of shooting, so he can deliver his theories in a very focused way so, yes, it’s literally a sequel. One of the things I didn’t get to do so well last time is Slavoj’s wardrobe; when we made the first film, the Art Director said “don’t you think we should put him in a suit?” and I said “Well, he is as he is…” and in fact, the Art Director was so right because by putting Slavoj in these clothes he would never normally wear, I think it produces, as it were, a performance. It’s different. He’s a wonderful person to work with, he’s a really generous person and while I know some of the ideas we’re going to be working with, I’m also fascinated and excited to see what he comes up with.